Sometimes the best answer to the question, “What’s for dinner?” is a jar of spaghetti sauce, a package of einkorn or spelt noodles, and a quick weeknight salad with homemade dressing. There is real value and convenience in knowing that a jar of quality spaghetti sauce (there are some great real food brands on the market) sits in the pantry waiting to be turned in to dinner. There have a been a number of times over the last eight years (the length of time that we’ve been enjoying a real food lifestyle) when the only thing that stands between me and a take-out menu is the jar of spaghetti sauce sitting in the pantry. Blender pancakes and/or scrambled eggs have also been known to stop a few hasty take-out thoughts. With that said, in my opinion, store-bought spaghetti sauce lacks the flavor and richness of homemade spaghetti sauce. Store-bought sauce also lacks the nourishing ingredients that may be added to a carefully-crafted homemade sauce. I think we’ve also gotten to a point in our fast-everything culture– which includes cooking and eating food–that many of us haven’t taken the time to slow down for thirty minutes and make spaghetti sauce at home. At least I hadn’t until we made the switch to real food. What took me so long?! The thought of making spaghetti sauce at home slightly terrified me (let’s remember that I didn’t cook much before our lifestyle change). My first few attempts at making spaghetti sauce at home were embarrassingly awful and inedible. With patience, and a good amount of seasoning, I finally developed a homemade spaghetti sauce that was not only edible, but also received rave reviews from Dustin. 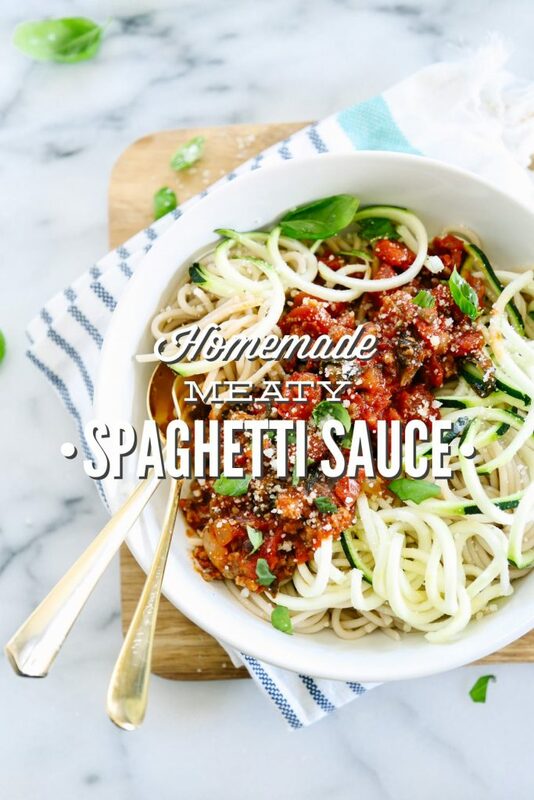 Homemade spaghetti (sauce) is now a regular meal on my meal plan calendar. Maybe you’re like me, and you’ve never made homemade spaghetti sauce before. Or, maybe you’re wondering why someone would spend an additional 30 minutes in the kitchen making homemade sauce when there are a number of “clean” store-bought sauce options available? Or, maybe you’re all about homemade spaghetti sauce, and you’re ready for me to jump straight to the recipe ;). 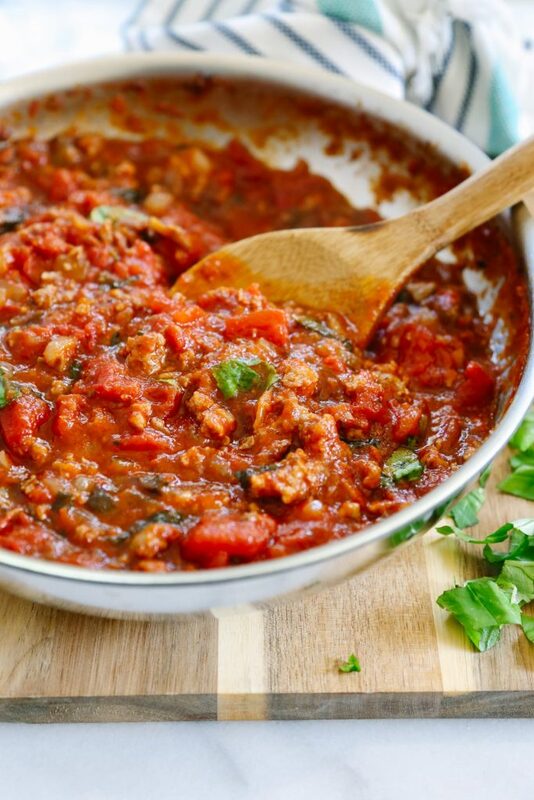 If you’ve never made homemade spaghetti sauce before, and you’re slightly terrified of creating the worst dinner ever by attempting to make homemade sauce, I’m here to place a skillet in your hand and say: You’ve got this! Friend, homemade spaghetti sauce is incredibly easy to make. If you can brown meat in a skillet, saute a few veggies, and open a can of tomatoes, then you can do this. A flavorful and simple homemade sauce is yours for the making. Now, if you’re questioning the very notion of spending an additional 30 minutes in the kitchen making homemade sauce, let me pour you a cup of red wine and say: I totally understand! Trust me, there are nights when I don’t want to make homemade sauce, and that’s when I reach for my back-up jar of “clean” store-bought sauce in the pantry. On the spaghetti nights when I spend the additional 30 minutes in the kitchen making homemade sauce, the extra time is 100% worth it. The beauty of homemade sauce is that I have complete control over the ingredients, which means I can create a sauce that’s not only delicious but also nourishing. I know exactly what’s going into my sauce, and I can adjust my recipe as I desire: more salt, more veggies, less meat, more meat, etc. If nothing else, knowing how to make something at home empowers me to make informed food choices when I need to purchase something from the store, like that jar of back-up spaghetti sauce. Finally, if you’re all about making homemade sauce, and you’re ready to jump straight to the recipe, let’s do this. Ready, set, let’s get cooking! 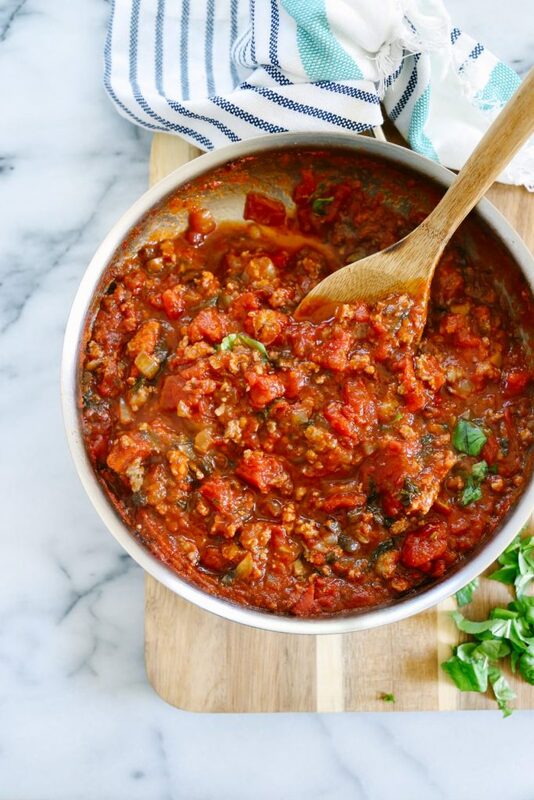 The beauty of homemade sauce is that I have complete control over the ingredients, which means I can create a sauce that’s not only delicious but also nourishing. I know exactly what’s going into my sauce, and I can adjust my recipe as I desire: more salt, more veggies, less meat, more meat, etc. 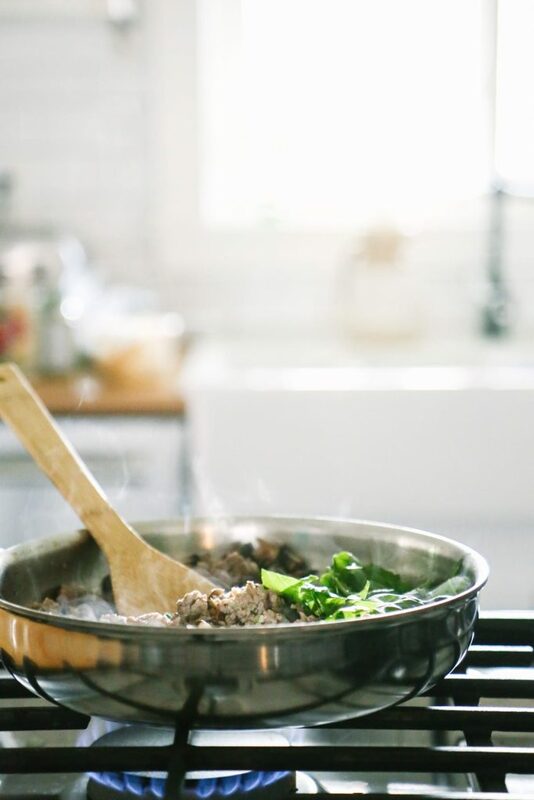 Heat the olive oil in a large skillet or Dutch oven over medium-high heat. Brown the sausage in the skillet. Once the sausage is slightly brown (there may still be a bit of pink, it's okay! ), add the onions and mushrooms. Saute the veggies for 3-4 minutes, until the mushrooms are brown and the onions are translucent. Add the minced garlic and dried oregano, and saute for 1 minute, just until fragrant. Now add the red wine to the ingredients, and stir. At this point I like to gently scrape the skillet with a wooden spoon to remove any of the bits that may be stuck at the bottom. There's incredible flavor in the little bits. Finally, add the remaining ingredients: fresh basil, tomatoes, tomato paste (see note below), and salt. Using the back of a fork, crush any of the large tomato chunks to help smooth out the sauce. The saltiness of your sauce may vary depending on the seasoning used in your sausage. The first time you make this sauce I recommend using 1/2 teaspoon of salt, and then increasing the salt to your desired taste after the sauce simmers. Simmer the sauce, covered, over low heat for about 20-25 minutes. This allows the flavors to "marry" together, and also thickens the sauce if you used tomato paste. I like to check on my sauce at the 15 minute mark, just to make sure it's not getting too thick. If you find your sauce is getting too thick for your liking, add a small amount of water (or more wine ;)). Before serving the sauce, give it a taste and adjust the salt to taste. If you find your sauce is a bit too acidic (depending on the tomatoes), add a pinch or two of sugar. Serve the sauce over spaghetti noodles, and top with freshly grated parmesan cheese and extra basil. The sauce will last in the fridge for 3-4 days. I highly recommend sourcing pastured sausage for this recipe. This simply means the pork comes from a pig that was allowed to roam the outdoors and enjoy a lifestyle that should come naturally to a pig. If your sausage comes in a casing, remove the casing with a knife, and then add the sausage (inside the casing) to the skillet. If you’d like to make this a meat-free spaghetti sauce, leave out the sausage and add an additional cup of chopped mushrooms. Speaking of mushrooms, I love baby portobello mushrooms in this sauce, but white or cremini mushrooms may be used instead. The red wine in this sauce adds a lovely flavor, and the alcohol is cooked out of the final sauce. I don’t have a particular red wine suggestion; just use one that you would also feel comfortable consuming. This sauce is a thick, “meaty” sauce. If you’d like a thinner marinara-like sauce, I recommend using 1- 14 ounce can of diced tomatoes and 1 14-ounce can of crushed tomatoes, or you could use 1- 28 ounce can of crushed tomatoes. I like Eden, Jovial, and Muir Glen brands. I’ve left the tomato paste as an optional ingredient. This ingredient helps to thicken the sauce, which I love, but you don’t need to add it if you don’t have any available or don’t want a really thick sauce. I like to purchase the tubes of tomato paste since I only 2-3 tablespoons of tomato paste at a time. 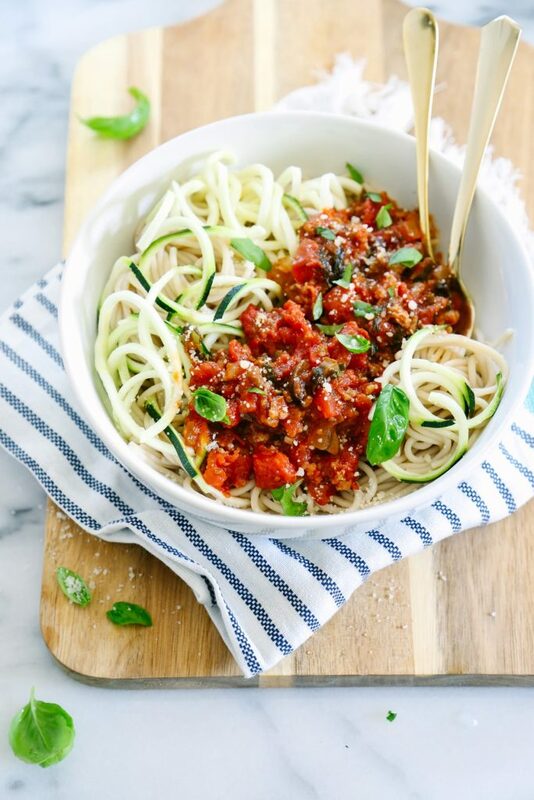 In the pictures you’ll notice that I like to serve our spaghetti sauce over a mixture of einkorn or spelt spaghetti noodles and zucchini noodles. 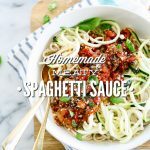 I usually mix the zucchini noodles (made in a spiralizer) with the warm, drained spaghetti noodles, and then spoon the sauce over the top. 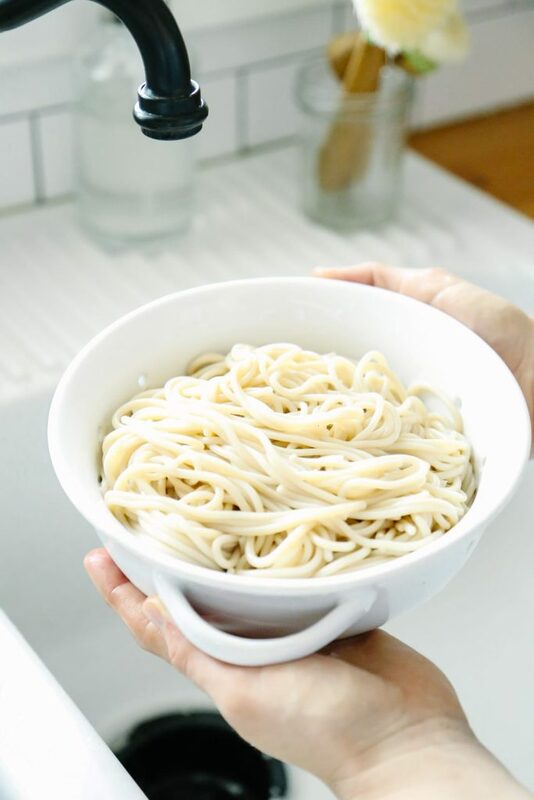 I’ve used a table-top spiralizer in the past with good success, and just upgraded to the KitchenAid attachment spiralizer. I just made this tonight, and it was fantastic! I’m trying to cut carbs, so I put it on zucchini noodles only–so filling and tasty. I’m new to your site, and this was the first recipe I’ve tried. Looking forward to trying more! That’s so great, Mary Lu! I’m so glad you loved the sauce. 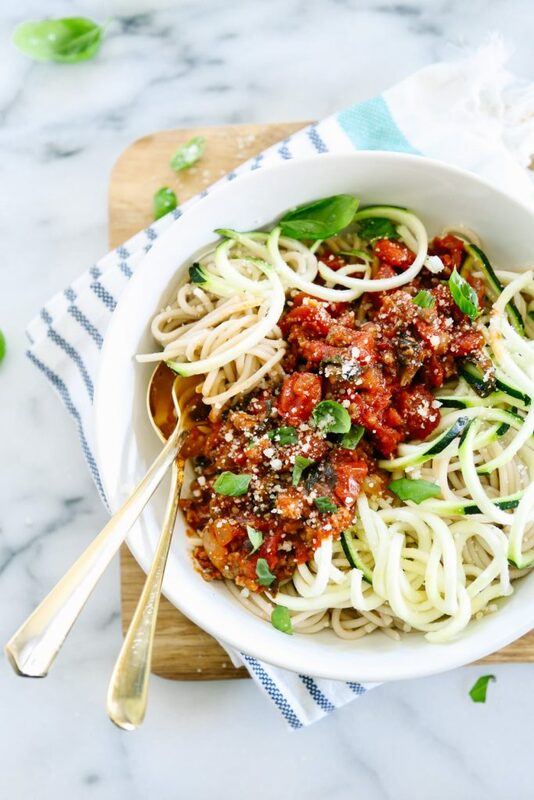 Zucchini noodles are so delicious–it’s such a great way to add even more veggies to this dish. Welcome to Live Simply! Sounds delish. Can it be frozen? Is there a way a can preserve this so its a store cupboard favourite? Hey Rhi Wee, This sauce freezes very well! I’ve never tried canning it, so I’m not sure if this is possible. Hi Kristin, Thank you for your blogs…I enjoyed checking out your ‘Real Food’ tried your blue berry muffins but changed it a bit. I made them very small, add semi-sweet chocolate, and use Kamut and Quinoa flour instead it was so good! Claudette, I’m so glad you’re enjoying the blog. Yum, what great substitutions! Hey Kelly, I think you could probably get away with not using the wine. I like the subtle flavor it adds, but I bet the sauce would be delicious without it, too. I don’t have any brands off the top of my head, but when I head to the health food store later I’ll take a look at the two that I usually pick up. Hey Kelly, I didn’t make it to the health food store the other day, but I’ll take a look when I make there again…hopefully by the end of the weekend. Sorry for the delay, Kelly! I finally made it over to our health food store today (the one I usually purchase wine from), and made note the wine I like for cooking: Tavernello (this is very inexpensive, and great for cooking) and Z: The Seven Deadly Zins (I also purchase this one from Costco at times). Both have been great for cooking, and aren’t super pricey. Thanks so much! I’m excited to give it a try! Thanks for your help! Even though we aren’t wine drinkers we really like the depth the wine adds to the flavor of this sauce. This is my go to for spaghetti night! Hey Kelly, I’m so glad you’re enjoying the sauce :)! !